Jarred our son is working on a project using a real hammer, a real nail and pieces of real blocks of wood. So now he made a special wish. 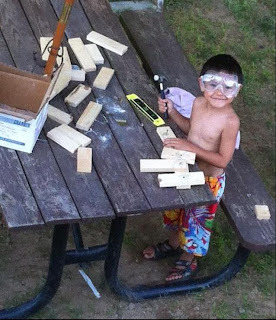 He would like to have a real drill just like daddy so he can make more projects. Jarred's 6th birthday is twenty three days from now and without him knowing daddy already added it on his birthday shopping list. I can't wait to do our shopping we know just where to get that special tool for our little boy. 0 Response to "Wishing for a real working tool"